Mr Pamsperambulation coined this phrase and encouraged me to write this post. I guess I’m busy dealing with it, whereas he has to sit and watch it. What we are really thinking of are the extra challenges of ‘Invisible Disability’ (health issues that severely effect your life, but not necessarily in a way that everyone can see). Invisible disabilities are many and various and by their very nature, you may not know who is suffering and struggling. This doesn’t mean that they are worse than very visible and obvious disabilities, just that they bring the extra challenges of people not even knowing you need help, understanding or special arrangements. 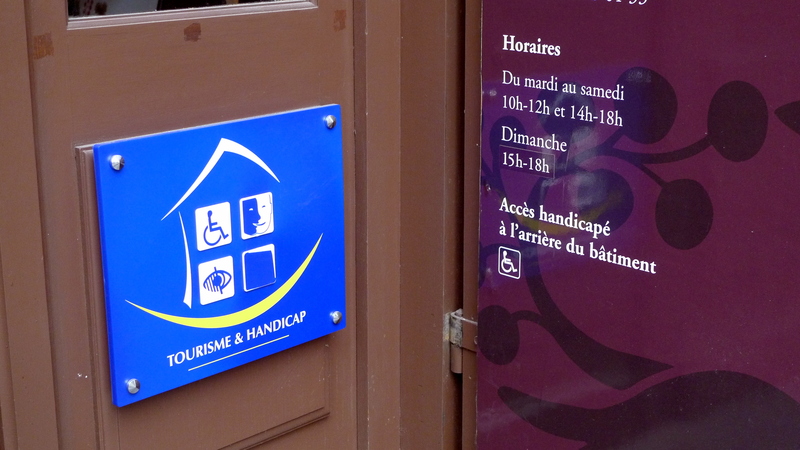 “Tourisme&handicap MOULINS” by Jeanlouiszimmermann. – Own work.. Such an example would be needing to use the ‘elderly or disabled’ seat on public transport, and getting accusing looks. But it goes much deeper than that. If you need something, you have to constantly ask or explain. An obvious disability cuts those corners. You may think I am perfectly healthy. If you don’t know me well, you won’t recognise the signs that mean I’ve had enough, I can’t cope any more or today is a really bad day. I may just appear rude, or disinterested. I may just go home because I don’t have the energy to explain that no I can’t just go upstairs because it’s full down here; I can’t park there and walk; I can’t sit on that chair for very long; I can’t concentrate for more than 40 minutes, however interesting you are; I can’t take part in any activity that lasts more than an hour because it exhausts me – however exciting it may sound; I can’t hang around waiting; I can’t stand in this queue; I can’t keep coming back at your convenience; I can’t talk for very long; I can’t even always find the words I want to string a sentence together; I can’t just go and do that… And they are just some examples from my problems, other people with other invisible difficulties will have their own. They may include access to toilets, needing space, help with logistics – the list is as long as the individual people. And we can’t always bear to have to explain AGAIN, because no one can see them. Today depression has hit the news again. Can you imagine how it would be to have to try to gather yourself to explain what that means in your life at this moment? What you need to help you? Yet it is very real, and by the nature of the illness often hidden, yet needs understanding and support. Not all adaptations that need to be made are physical. Sometimes we need to change the way we say things and the atmosphere we present. It is true that we never know what is happening in someone else’s life, how it is to live the life they live. They may appear stroppy, attention-seeking, awkward, distant or any other way of being – but we do not know what they are battling or living with; how much it might have taken them to get up or be where they are. We should make no assumptions and no judgments. We should find out what we can do to help, to make life and events accessible (and not promise you will if you haven’t thought that through or don’t mean it); accept what people need to do to make something bearable (that may mean something like lying on the floor – that needs to be OK, not questioned or tutted over); try to help and most of all seek to understand – not necessarily by asking lots of questions, just taking what is. Disability is hard enough, please don’t make it any harder by your reaction, lack of reaction or failure to understand. Listen, accept and do what you can to make life as easy and bearable as possible. Because actually that applies to everyone, not just those who have a ‘disability’. Perhaps it would be good never to assume that another person is OK just because they may look or sound OK.